Sarojika is a busy woman. Every morning she along with a few other women prepare nutritious food and package them. The food they prepare is meant for consumption by children in various Anganwadi centres. These packages are then delivered at the Anganwadi centres under the supervision of the women. Sarojika has been doing it since 2017 under a government scheme named ‘Ready to Eat’. Sarojika is the president of the Suraj Swasahayta Samuh in Akrikona village in Jashpur district of Akrikona village. She lives in a family of eight members including her husband, four children and parents-in-law. Her husband is a farmer. They have three sons and one daughter. The income in her family was limited and there was always the need for more money. She had formed a Self Help Group to take benefit of government schemes. 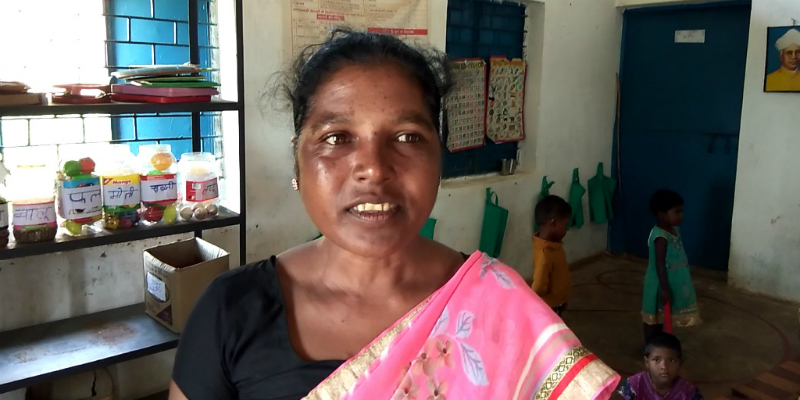 When Sarojika first formed the Self Help Group people discouraged her saying she would not be able to manage it. But she and nine other women went ahead and got involved in various activities. All of them wanted to prove that they can do something on their own. After getting involved with various activities, in 2017 they got involved with the Ready to Eat scheme. Under Ready to Eat, they prepare food for and supply them to various Anganwadi centers. The food is consumed by the children in those Anganwadi centers. The SHG in which Sarojika is involved supplies food to 24 Anganwadi centres. The Ready to Eat scheme has changed the lives of her and other women. “This has increased our incomes. We manage everything from preparing the food to the delivery at the Anganwadi centre. Everything is done by the women and it is an empowering experience for everyone.” Says Sarojika. She feels that it has increased her confidence for other work too. “Our confidence level has increased tremendously. We believe we can also manage other work.” She says. The Ready to Eat scheme has helped a lot of women earn their livelihood through the Self Help Groups. These women have significantly increased their incomes and are happy to be contributing to their families. “I don’t ask my husband for money. I take care of my expenses by myself. It makes you feel independent. I want to ensure good education for my children. I want to see them settled successfully. This is my biggest dream and working on Ready to Eat is helping me achieve that.” She says. The Ready to Eat scheme has been implemented in order to achieve the dual objectives of ensuring nutrition to children in the various Anaganwadi centers as well as to provide livelihood options for the women. Under this scheme, a lot of women like Sarojika have been provided livelihood through various Self Help Groups. These Self Help Groups are given the responsibility to deliver the ‘Ready to Eat’ food packages to a particular number of Anganwadi centers. The women are also provided training and support for efficient management of the work under the ‘Ready to Eat’ scheme.